The host of royalty, celebrities, and heads of state since its inception, Arion has always been rated par excellence for its coveted setting and luxe accommodations. For 40 years, Arion Resort & Spa has been ideally situated to highlight the best of Greece's offerings. Located on a quiet, gated peninsula on the Athenian Riviera, its rocky promontory and private beaches are reminiscent of the most beautiful Greek isles. Yet it's only 15 miles from downtown Athens, affording easy access to the city's buzz—and a quick retreat from its crowds. It's also just minutes from the exclusive shopping district and trendy beaches of the Athenian suburb of Glyfada. 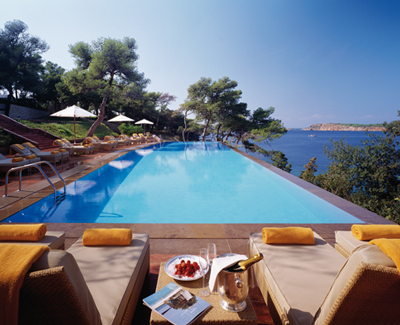 The Arion shares facilities with its sister property, the Westin Athens, on the 75-acre Astir Palace complex. With their combined resources of seven restaurants and four bars, multiple pools and private beaches, tennis courts, a marina, and a sports complex, you can find just about any activity, atmosphere, and cuisine you might imagine or desire. Recently added to the Luxury Collection of Starwood Hotels & Resorts, The Arion's furnishings have been beautifully upgraded, the exceptional Arion Spa has been added, and the staff has been meticulously retrained. But some things haven't changed; most guest rooms and suites still have a commanding view of the sparkling Sardonic Gulf, with large balconies from which to take it all in. Decor is simple yet plush, with touches of marble and warm woods. And bathrooms are glistening and voluminous, with separate showers and baths, double sinks, and lovely ambient lighting. The result is a perfect balance of classical European elegance with modern style—all of which is mere window dressing, of course, to Arion's true charms: its gift of the warm Greek sun and the legendary beauty of the Mediterranean.